Netflix is adding video previews for all of its content. These video previews are designed to give you a better idea of what to watch next. Because as good as the written word can be, nothing beats seeing a video preview of the thing you’re deliberating whether or not to watch. We all know that the Netflix catalog is shrinking Netflix Removes 50% of its Catalog to Fund Original Content Netflix Removes 50% of its Catalog to Fund Original Content Have you noticed the Netflix catalog getting smaller in recent years? We now know the number of titles available on Netflix has been halved since 2012 to fund original content. Read More to make room for more original content. Which is a double-edged sword given how good shows such as Stranger Things and Black Mirror are. However, despite this there are still lots of movies and TV shows to choose from on Netflix. The quantity and quality of content available on Netflix can make it tricky to decide what to watch next. And those little text descriptions, though fun and whimsical, don’t always sell you on the content. Which is why Netflix is now introducing video previews. These video previews aren’t teasers or trailers, but “specially designed video synopses that help members make faster and more confident decisions by quickly highlighting the story, characters and tone of a title”. In other words they offer a snapshot of the content you’re browsing. As Netflix explains in its blog post detailing the new feature, “We know we have less than 90 seconds to capture someone’s attention and get them excited about a title”. These previews should therefore allow people to “browse less and watch more”. Netflix is evolving. First there was the push into original content 7 Awesome Netflix Originals You Should Watch ASAP 7 Awesome Netflix Originals You Should Watch ASAP Despite only producing its own content for a short period of time, Netflix has created some fantastic original shows. Here are seven Netflix Originals we recommend you watch as soon as possible. Read More . 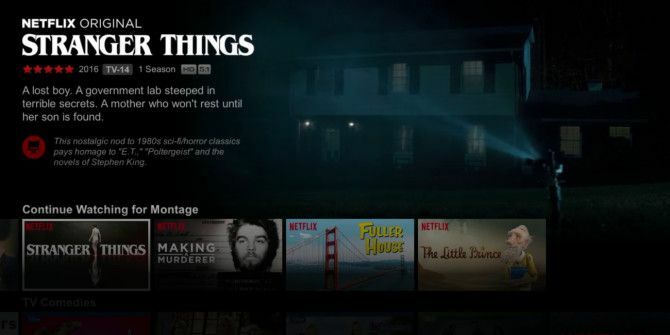 Then came the option to download content to watch offline You Can Now Download Netflix Shows to Watch Offline You Can Now Download Netflix Shows to Watch Offline Netflix is now allowing users to download content from its catalog to watch offline. This means you can enjoy Netflix even when you can't find a decent internet connection! Read More . And now we have an important change designed to make Netflix a more seamless viewing experience for its users. The perfect streaming service doesn’t yet exist, and there are some perfectly valid reasons not to subscribe to Netflix. However, it’s probably the best option we have at this point, even though Amazon managed to persuade Jeremy Clarkson and co. to set up shop on Prime Video instead. Do you watch Netflix on a regular basis? Do you find yourself spending ages researching what to watch next? Do you find the text descriptions useful? Or do you think these video previews will prove to be much more useful? Please let us know in the comments below! AT&T Reveals Massive 17-Inch Tablet: The Samsung Galaxy View 2What’s the Best Media Streaming Device? I find the previews really annoying. If i stop moving the highlight box just for a split second I'm bombarded by incredibly loud noise and shouting. I know I sound like an old duffer (not quite there yet...) but it's not necessary. Most Netflix originals have an option to watch a proper trailer - which allows me to view it on my own terms, but to force me to watch a clip whilst I am trying to read the blurb is stupid. It makes me wonder if Netflix things that it's customers are so frail and brain dead that a dozen words to are too much to handle and need to be hand held and spoon fed into watching a show. This new scheme backfires on me and I tend to whizz past and show that stars to play before I have decided if I want to actually watch it or not. All your links point to Amazon which doesn't generally ship here. Extremely disappointing.